Do you have not much time to pick the favorite one? Now you found the most suitable one. MULTIPURPOSE: This bag can be used as cosmetic makeup bag, toiletry bag, jewelry/electronic devices storage case. storage case at home,just zip it up and you are off. when you travel, free your hands. SAVE PLACE: When you don't need it, folded it up and it just takes up a little place,NO MESS. SMART DESIGN: Wide-open design allows accessing items easier and faster. A makeup bag for travel. An electronic devices case for work. A toiletry bag for vocation. A stationery case for school. A jewelry case for home. Do you think this is a cheap quality product when you see the price? material, but it must be a decent quality material. Do you think our products is more expensive than others? use it.Buying a product expensive price,you are indeed unhappy when you order, but you will be happy when you use it. A excellent product is worth a reasonable price. All dimensions are measured manually with deviation,please allow tiny measuring error in normal range(1-3cm). New Bag may come with material smell. Please do not worry about, just put the bag on an airy space for a while. ❤PREMIUM MATERIAL❤Made of decent quality PU leather, polyester lining and built-in foam - waterproof, shockproof, anti-wear and lightweight. 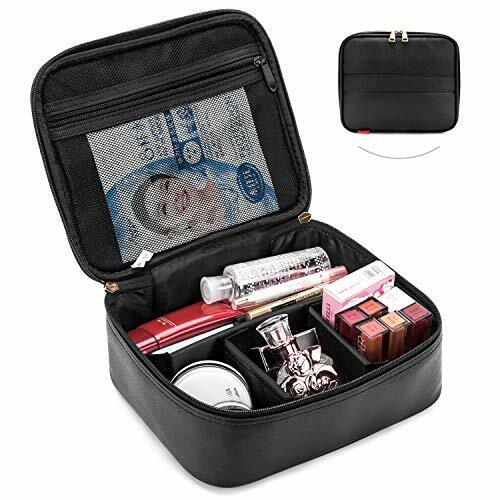 This travel makeup bag provide excellent protection to you cosmetics. ❤DIMENSION❤9.5 x 8 x 3.5 inch, small and exquisite but roomy, great size for travel on vocation.Carrying all essential cosmetics, make up tools, toiletries in one case, and you can make up everywhere. ❤MULTIPURPOSE❤Used as cosmetic makeup bag, toiletry bag, jewelry/electronic devices storage case, suitable for both home and travel. Specially designed for women and girls, excellent gift idea. ❤SMART DESIGN❤You can DIY the internal compartments by 3 adjustable padded dividers to fit your need. Adjustable Velcro divider and wide open design allow accessing items easier and faster, save your digging time by half. There is a big mesh pocket at the top. ❤CHARACTERISTIC❤This cosmetic bag is cost-effective, fashionable, spill-proof interiors, saving place and reducing mess. Equipping a leather handle, portable and easy to carry. If you have any questions about this product by NiceEbag, contact us by completing and submitting the form below. If you are looking for a specif part number, please include it with your message.